Kate Middleton was snapped wearing a grey peplum dress from Matthew Williamson's pre-fall 2012 collection at the London premiere of 'Wild Cats' last month. I'm a big fan of Kate's style, she always manages to look elegant and glamorous! I loved the classic style of this dress with the subtle peplum frill and tribal inspired turquoise beaded detailing on the neckline and sleeves. I was just looking on the Warehouse website when I came across this dress in their sale which is a dupe of the Matthew Williamson dress Kate wore at a fraction of the price! 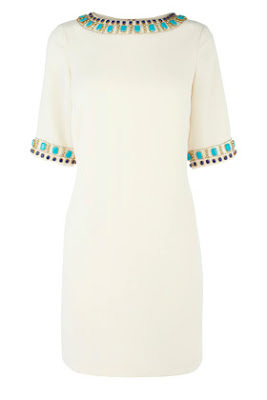 The cream shift dress has embellished gold and turquoise sleeves and a jewelled neckline similar to the Matthew Williamson dress. It was originally priced at £75 and has been reduced down to a bargain £25! It's also available in midnight blue. It's a timeless design and would make a lovely dress for a summer party. Snap it up now before it sells out! What do you think of Kate's dress? Have you spotted any designer inspired pieces lately? Omg Caroline what an amazing likeness! Wow! Such a great spot! It has a very modern Cleopatra kind of vibe to it, doesn't it? Very lovely and very Kate! Great job finding a dupe! wow, so chic and great dupe find! Wow! That dress is such a bargain, it's going to sell out so quickly! Caroline this is such a good find! I bet you any minute now Warehouse will be selling out of these bad boys! You should try and find a copy of the long white dress with the slit she wore recently to Claridges...I can't remember now who the designer was but I'm sure they'll be loads of pictures of it! That Warehouse dress is gorgeous, and such a bargain too. I can't believe it's reduced to just £25, very tempted to order one! That's adorable. It reminds me of Cleopatra, which is fantastic. I adore this dress thanks for sharing the cheaper option...it's just as lovely!